ROCHESTER – With 40 minutes of grueling practice drills complete, the Rochester Americans huffed and puffed between sips of water or Gatorade while listening to second-year head coach Chris Taylor deliver instructions. Suddenly, most of the team broke out with a raucous cackle that echoed throughout an empty Blue Cross Arena. When Taylor was done explaining the drill, the Amerks split into groups and furiously skated the length of the ice to the soundtrack of the coach's whistle. The well-traveled 47-year-old's philosophies and hockey acumen are the product of 28 years in professional hockey, and his willingness to adapt has led the Amerks to consecutive playoff appearances while developing the next wave of Buffalo Sabres. "He’s a guy who garners respect because of the way he is," Amerks goalie Adam Wilcox said. "How he coaches is effective. There are different ways you can get more out of players. You can do it by scaring them, but I think he gets the most out of players by being around them, enjoying them. He lets them be creative and be themselves at the rink and enjoy each other. That doesn’t take away from working hard or playing well. It has the opposite effect. It helps everyone. They want to come to the rink to play for a coach like him." Taylor began planning his post-playing career almost six years before his final game. He was 32 years old and played 54 games with the Buffalo Sabres in 2003-04, the season before the NHL's work stoppage. Taylor thought a return to the sport's highest level was unlikely at his age. While his passion for hockey still burned, he wondered when his body would tell him to stop. He always was a leader on and off the ice. Even in the American Hockey League, where he was the oldest Amerk competing against younger players to earn a call to the NHL, Taylor enjoyed teaching his teammates the intricacies of the game and the maturity needed to be a professional. His teammates always knew what would come next. "It was pretty obvious that he'd be a coach," Nathan Paetsch, a 36-year-old do-it-all Rochester veteran who played four seasons as Taylor's teammate, said. "He was a captain and one of those player-style coaches already. He was intelligent. Played the game in a smart way that can translate to being a coach." Over time, Taylor's fear of not getting another call to the NHL became a reality and he finished his career with 32 points in 149 games at the sport's highest level. Still, following the league's lockout, Taylor spent three more years in Rochester and three in Germany. During that time, he balanced trying to earn another opportunity in the NHL and preparing himself for a post-playing career. He spent additional time with younger teammates after practice and began watching game film through the lens of a coach. In Rochester, Taylor continued to mentor and teach younger players. In Germany, he learned that Europeans often struggled with homesickness while pursuing a professional career in North America. He experienced the same problem when he played in Europe. That perspective, Taylor said, helped him better understand the psyche of young European players he would eventually coach. Paired with the lessons and observations while learning under a number of former coaches, including Butch Goring, Gary Agnew, Pat Burns, Lindy Ruff and Randy Cunneyworth, Taylor achieved a better understanding for the questions that lingered throughout his playing career. "You see what works, what doesn’t work, how the guys feel," Taylor told The Buffalo News. "How I wanted to be coached. How I wanted the coach to react to different things. I took all that in. There are times you wonder why a coach does a thing and then you realize that’s why and you learn. I’ve taken a lot of different coaches and instances from when I played and translated it into what it is today. "There are times you can be hard on guys. There are times you can let guys have a break. It’s always interesting that when you go back to how you were as a player, it helps you as a coach – the empathy of what they're feeling." Taylor, a second-round draft pick of the New York Islanders in 1990, was 39 years old and had played 617 AHL games when the 2010-11 season ended, yet he believed he could continue playing. At the same time, he began looking for assistant coaching jobs. 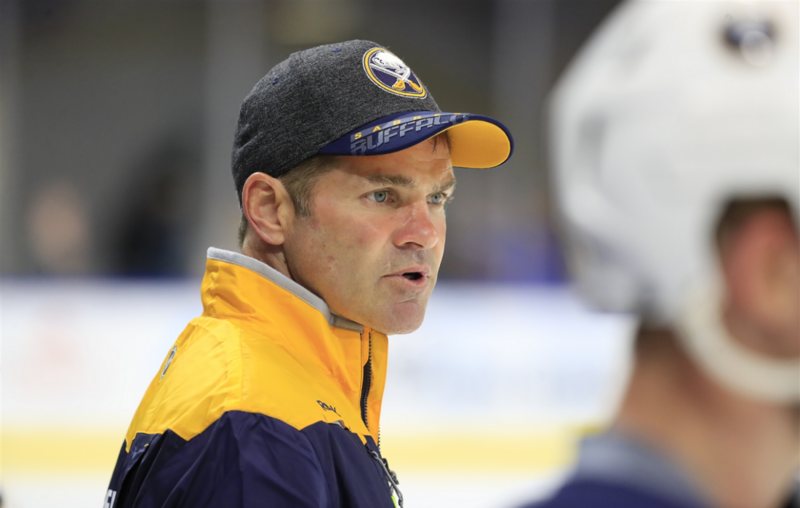 His search ended when former Sabres General Manager Darcy Regier offered him to work as a player development coach in Rochester. Upon joining the staff, Taylor gave individual skill sessions to the Amerks, but there was a particular focus on prospects Marcus Foligno and Zack Kassian. When the three weren't skating together after practice, they were usually talking about hockey or sharing ideas while watching game film. Though Taylor was only a few months removed from playing, he wanted to understand how young players responded to certain situations on and off the ice. He found the job addicting. Taylor craved more responsibility and his role grew the following season when he was promoted to assistant coach with the Amerks. He would spend four seasons on Rochester's staff before taking the same job with Wilkes-Barre/Scranton and returned as coach in June 2017. "I love it," Taylor beamed. "Working with young guys is the most gratifying thing. There's nothing better than telling a young guy he's going up to play his first NHL game." Paetsch gritted his teeth, leaned over to a wooden table adjacent from the team's dressing room and knocked twice with the knuckle of his right index finger. The gesture was in response to a question about another remarkable statistic: the Amerks had not lost more than three games in a row all season. He then shared the unique perspective that comes with playing 807 games between the NHL and AHL. "That’s coaching," Paetsch said of Rochester's consistency. "Coaching and we have some really good leadership in that locker room. It’s accountability. If you have someone who will get on you, freak out and panic – it starts with the coaching. It starts from the top and trickles down to the players, and we don’t have that. We have accountability and we work hard every day, but we don’t allow it to slip because we have that leadership from up top." Paetsch's teammates shared similar views. When the Amerks' goaltenders struggled in a 9-4 loss to Springfield in November, Taylor pulled aside Scott Wedgewood and Wilcox to give a quiet vote of confidence. There were no threats to decreased playing time, Wilcox recalled. Instead, Taylor wanted them to remain calm. They responded by helping Rochester earn three of four points the following weekend. "Sometimes coaches may play mental games with goalies and it can backfire, but brushing stuff off like that and remaining calm helped us going into the next game," Wilcox said. "As long as we’re doing the right things and working hard, he’s not going to hammer them for losses." When the Amerks were swept in the first round of the Calder Cup playoffs last April, Taylor wanted to make subtle adjustments for this season. Though he kept the team's offensive and defensive structure, he made tweaks after assessing what worked and what didn't. He also began asking his players for feedback after practice and, during film sessions, asked them which drills they liked. When Paetsch was a healthy scratch earlier this season, Taylor asked the defenseman for additional perspective. Taylor never shies from spending time with players in the dressing room, but has delegated responsibility to Paetsch and veterans. There is also an emphasis on patience. "As a player, it bugged me when, if the team had a bad game, all the lines changed and other things changed," Taylor said. "We have a good structure and I want to stick with it. If there is something we need to improve and I see it in a 10-game span or a five-game span then we’ll change that. I think patience is key. Be respecting of the players and what they want, how they want it, and what I think is best for them, is what you have to do. You can’t panic in those situations." Taylor often joins the Amerks for breakfast before practice. Conversations aren't dictated by the outcome of the previous game. Harsh critiques and teaching points are saved for practice or film sessions. That strategy is part of Taylor's plan to maintain a positive atmosphere that has helped put Amerks back in the playoffs. He wants his players to enjoy coming to the arena every day. While on-ice sessions are rigorous and he doesn't mince words, he doesn't want to disrupt the chemistry his veterans have helped build. "That makes me want to work harder because he lets you have fun but you can lose that," Wilcox, 26, said. "You want to keep that atmosphere and the coaches happy, so you work harder to keep the atmosphere. ... Guys want to play for him and win for him." Taylor's impact can be best illustrated by the development of the Amerks' young players. Victor Olofsson, Rasmus Asplund and Lawrence Pilut, all of whom are in their first season in North America after playing professionally in Sweden, have flourished. Prior to his recall, Olofsson led the Amerks with 27 goals among 60 points. Winger C.J. Smith entered Friday's games with 27 goals and winger Alexander Nylander proved ready for the NHL once he was called up last month. Taylor's work with assistants Toby Petersen and Gord Dineen has the Amerks playing with the consistent structure that can be difficult during a grueling schedule. "'Tails' is great at teaching the little things, which way to turn your stick, how you want to make this pass or that pass, where to look if you want to look a defenseman off," said Amerks' 33-year-old captain Kevin Porter, who also played under Taylor in Wilkes-Barre/Scranton in 2016-17. "Little things like that, he’s great at teaching forwards. I think it's definitely helpful with young players. When you come from juniors or college, it’s a different game." Entering Friday's games, the Amerks were competing for a North Division title and the team's first Calder Cup since 1996. No matter the stakes, the Amerks don't plan to change their culture. Neither does Taylor. "We have a lot of work to do, but it’s been great," Taylor said. "Every year you wonder are we going to have the same type of guys? Are we going to have the same vibe in the dressing room? We have. We created that and I’m the type of guy that I want everyone coming in feeling good about themselves. "Yeah, you’re going to have some bad games and we’re going to talk about it, but it’s not going to change our personalities of each other or what we are as a group. That’s something I will always do, I won’t change my personality, win or loss. I will make sure it’s well-known what we need to get better."